It all ended in Seattle. This year, Microsoft has invited hundreds of students which comprised the 35 teams with their mentors in its hometown in Seattle, Washington last 29th of July – 3rd of August 2014 for the culmination of the Imagine Cup 2014 World Finals and the first ever Global Microsoft Student Partners Summit where 80 students from the pool of 7000 MSPs worldwide were chosen to gather and celebrate their achievements in the program, attend series of sessions, experience the Microsoft HQ and bond with their fellow MSPs throughout the week. This year’s Imagine Cup World Finals has been significant and historical for the Philippines because of the representatives we had this year. Months before the announcement of the World Semifinalists, Philippines already made a mark by winning First Place at the Imagine Cup 2014 Online User Experience Challenge with Team Hiraya from Treston International College. They prevailed among hundreds of teams worldwide for their project Via, a Windows Phone 8 app they’ve designed. And after months of judging, Team Animus from De La Salle – College of St. Benilde surpassed the World Semifinals and became the sole team representative of the Philippines to the Imagine Cup 2014 World Finals – Games Competition with their project FitPals, a fitness Kinect adventure game designed for children aged between 4 to 7 years old. The game features various levels with basic exercises integrated with basic educational tools that allows kids to exercise both brain and body while having fun. Parents can also track their child’s progress (Calories burned, time spent playing, etc.) and share their child’s achievements via our Facebook integration through our Windows phone and Windows 8.1 apps. Team Animus members Charlene Ho, Trish Alonzo, Juan Miguel Maningo and Rizzi Sanidad with their mentor Ben Uy, really did a remarkable job for their project. Out of teams who joined the yearlong competition, they were one of the world’s best and chosen to be with nine other teams in the category vying for the cup. On the other hand, the Microsoft Student Partners Summit was also represented by two MSPs from the Philippines, Gabriel Eric Villanueva from Treston International College, and James Gabriel from Bulacan State University. There were a total of 80 MSPs invited by Microsoft and representing the Philippines in behalf of all Microsoft Student Partners in the country really means a lot to them. Even before everything started, our representative for the Microsoft Student Partners Summit, Gabriel Eric Villanueva got the chance to have a small chat with the program lead of the Imagine Cup, Mr. John Scott Tynes during breakfast time. Gabriel told him that it was indeed a dream come true to finally experience the Imagine Cup World Finals, in line with his delegation at the MSP Summit. He also got the chance to send his teammate’s regards (Team Hiraya) in behalf, to him. It was indeed a memorable opportunity for him to finally meet the man behind the world’s largest technology competition in person. And few hours after, he received a tweet from John that he just shared their small conversation and featured it at the Imagine Cup Blog during that day: http://bit.ly/1rkQ7ZB. It was indeed a great moment for our Microsoft Student Partner, Gabriel to be featured at the Imagine Cup site that day. The first day of the Imagine Cup World Finals Week officially kicked off during the evening of the 29th of July, after the arrivals of the World Finalist Teams and other attendees during the entire day, where a welcoming dinner was held at the Red Square of the University of Washington. 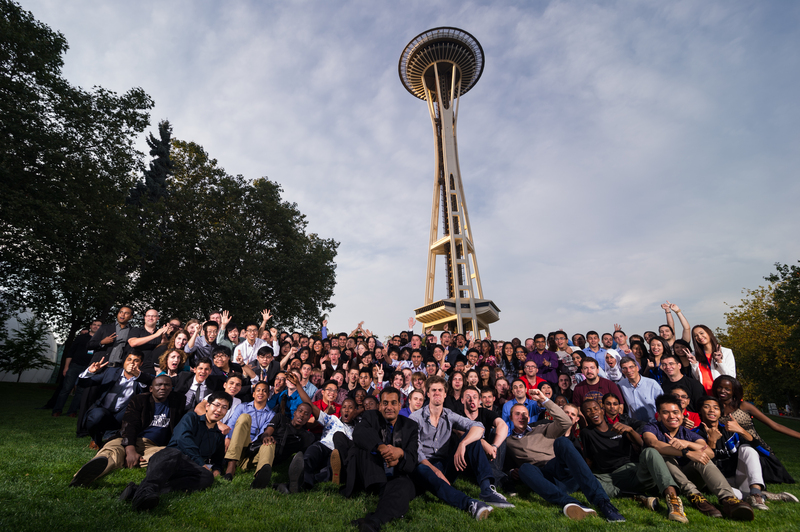 During the 30th of July, 2014, the Imagine Cup 2014 World Finals presentations headed underway at the Kane Hall of University of Washington. Teams on that day truly gave their all to present their project to the World Finals judges in the Games, Innovation, and World Citizenship categories. Our own Team Animus really did an exemplary job during their live presentations for their project, FitPals. Even the YouthSpark reporters and Mr. Andrew Parsons, the new Developer Audience Marketing Lead for LeX (Learning Experiences) at Microsoft applauded the team for presenting the game wearing the national costume and for representing the Philippines well. One reporter added, and acknowledged the concise answers given by the team to the questions of the world finals judges. Meanwhile in Redmond, while the Imagine Cup Live Presentations are happening at the University of Washington – Kane Hall, the Microsoft Student Partners finally reached the Microsoft Headquarters to kick off the day one of the Microsoft Student Partners Summit. Mr. Scott Burmester, the Senior Program Manager of all Microsoft Student Partners Worldwide started the event by welcoming the MSPs from all around the world. It was an overwhelming feeling for the MSPs who attended to be acknowledged by Mr. Burmester and call them as the best of the best MSPs, since there are over 7000 Microsoft Student Partners around the world and out of this pool, 80 were given the chance to attend the Summit in Redmond, and at the same time witness the Imagine Cup World Finals live. After all, The MSP Summit is focused on celebrating the achievements these students have accomplished during their participation in the Microsoft Student Partner program, as well as provide them with an opportunity to develop their technical skills via deep-dive technical sessions and networking opportunities with product teams. During that day, series of talks were given by the icons of Microsoft. Mr. Kurt Steck, the General Manager for Developer Experience talked about the Audience Marketing Insights; Murat Burme, Technical Evangelist for Emerging Business talked about the Redmond Startup Program where he introduced the teams who participated in this program and the experience they’ve had while in the program. MVP Mentorship Program was also discussed by the Senior Program Manager of the MVP Program worldwide, Ms. Kari Finn, where MSPs may consider having mentors who are Microsoft Most Valuable Professionals in order to further boost their skills and knowledge in a specific technology they prefer. To cap off the first half of the MSP Summit day one, Mr. Giorgio Sardo, the Senior Evangelism of Microsoft talked about the Universal Windows Apps. In the afternoon, the MSP Summit day one wrapped up with talks from Mr. Bryan Tomlinson, the Senior Manager for Windows and Mr. Andrew Parsons, the new Developer Audience Marketing Lead for LeX (Learning Experiences) at Microsoft. They talked about Windows and Windows Phone and Game Development, respectively. Before the day officially ends, the Imagine Cup teams and Microsoft Student Partners finally got the chance to prepare at the Microsoft Commons Soccer Field for their showcase setup. The showcase setup is also timely for the students as well for them to experience the things a Microsoft employee have experienced. This is because Microsoft OneWeek Product Fair was also happening at the field during that week where the employees are showcasing their projects as well to their fellow Microsoft employees. However, due to NDA matters, the tent where OneWeek Fair took place is off limits to the Imagine Cup finalists and Microsoft Student Partners since the products being showcased are the products that are not yet released in public. In other terms, the products they showcased may be considered as the next big releases for Microsoft. Anyhow, given the opportunity to join the booth with Imagine Cup finalists and Microsoft employees nearby was already a big thing for the Microsoft Student Partners, because they also get the chance to experience how it feels like to promote their apps and solutions to the employees of Microsoft. The 31st of July is considered to be one of the peak moments of the week since it is the last day of the Imagine Cup World Finals prior to the announcement of the winners the next day as well as the Microsoft Student Partners Summit. The closed door hands-on judging happened on that day at the Microsoft HQ Commons – Soccer Field Imagine Cup Showcase Tent where the teams would really have to give their last shot since it will wrap up the efforts they’ve made for the entire competition. Meanwhile, at the Thunder Conference Room of Building 92, the last day of the Microsoft Student Partners Summit started with the series of talks about the Role of MSPs, headed by Microsoft’s Senior Director for Audience, Ms. Victoria Grady. The Microsoft Research Director Ms. Rane Johnson was also present to discuss the amazing projects of the team. Ms. Valerie Anderson, the College Staffing Consultant of Microsoft also gave tips to the MSPs about how to get a job in the world of tech. capping off the morning sessions at the summit was a talk about Kinect for Windows by Mr. Ben Lower, the Developer Community Manager of Kinect for Windows. Before lunch time, there were selected Microsoft Student Partners who took part at the Mock Interview at the recruitment building of the campus, this is to let them experience how job interviews are being done at Microsoft. It is a cool opportunity as well to get some insights on securing a job during the interview process, and our Microsoft Student Partner Summit reps Gabriel Eric Villanueva and James Gabriel were lucky enough to experience the interview. For the last day of the Microsoft Student Partners Summit, the Microsoft YouthSpark team prepared a special lunch for everyone at the Building 121 Common Area. Ms. Suphatra Laviolette, the Digital Marketing Manager of YouthSpark and Ms. Yvonne Thomas, the Senior Program Manager were the hosts of the lunch where they have discussed the new program under Youthspark, and that is the Youthspark Advocates program and the MSPs who attended the summit are now part of the team. The program is about the YouthSpark Advocates who are handpicked by Microsoft Citizenship from the community. These are either MSPs or anyone who is an advocate of social change. These advocates are on a journey to represent the YouthSpark program at campus or school events, and even online. They are also entitled to make professional connections with Microsoft employees and others using technology for social change. These advocates are also trendsetters. They will be the first one to hear cool stuff happening at the program and even take advantage of the cool opportunities. The gathering of MSPs, now also YouthSpark Advocates has become a fun afternoon filled with joy and high enthusiasm with Ms. Suphatra and Ms. Yvonne. After lunch time, the Microsoft Student Partners went to the second day of the product showcase at the Imagine Cup Showcase Tent, where the next batch of MSPs were given the chance to promote their apps and solutions. For the Facebook Creativity Award, Team IJ Developers won a $25,000 Facebook advertising credit for their project Ladybug, a household electricity monitoring and automation project that beautifully integrated Facebook functionality into their community features. For the AppCampus Award, two teams were chosen for their outstanding Windows Phone apps. Each team will receive 20,000 Euros from AppCampus, a mobile innovation program funded by Microsoft and Aalto University, Finland. Team Tep from Hungary won for their project, Tep, a virtual pet whom you care for by exercising and getting fit. Team Brainy Studio from Russia won for their project, TurnOn, a clever game about using electricity to light up a dark town. These three teams will join the winners of our Apps for Office Challenge and our Windows & Windows Phone Challenge at a celebratory dinner high atop the Space Needle! Congratulations to all of these great teams for their hard work and much-deserved recognition. The entire Redmond experience won’t be complete without visiting the Microsoft HQ Company Store. 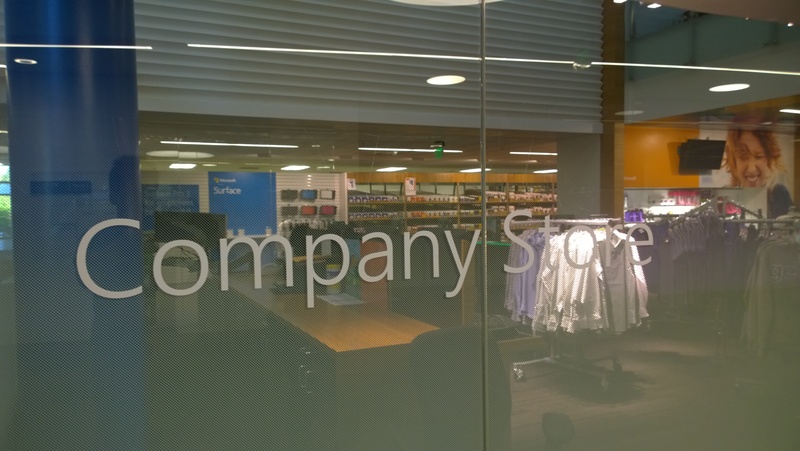 The Microsoft HQ Company Store is comprised of two sections. The first section is open to everybody, where they could purchase available Microsoft merchandise ranging from Microsoft, office shirts to jackets and more. Everyone is entitled to purchase anything they can from this section. The other part of the store is the hardware/software section. This is the section where only Microsoft full time employees can access. This section is filled with cool Microsoft hardware and software products at a discounted price. To top it all off, Microsoft gave the chance to all Microsoft Student Partners Summit delegates, Imagine Cup World Finalist Teams and mentors to shop at the hardware/software section of the company store with a personal shopping limit of $120 just like a Microsoft employee (but FTEs can purchase as many items as they can without any limit). Entering the store will make you get everything you see but of course you’re limited with the money that you have. It’s indeed a once in a blue moon opportunity, and will always be memorable to experience this as a student. Before the day officially ends, the Microsoft Student Partners were requested by Mr. Scott Burmester to go back to the Thunder conference room for some announcements. And little did they know, big surprises await the MSP Summit delegates. When everyone is gathered in the room, Mr. Burmester announced that the delegates will bring home a new Microsoft Student Partners backpack, Microsoft Student Partners Jawbone Speaker, Kinect for Windows 2.0 and Windows Embedded Kits. The announcement brought so much joy in the room. Before leaving the Campus, the MSP representatives and the Microsoft Student Partners Country Lead for the Philippines, Ms. Duchess Domagsang got the opportunity to have a picture with Mr. Scott Burmester along with the Philippine flag. The entire experience will surely be remembered forever. That marks the end of the Microsoft Student Partners Summit and the Imagine Cup 2014 competition. The judges just need to tally up scores and determine who won for the World Championships event the following day. Since Imagine Cup started in 2003, students all over the world have teamed up to make the world a better place. By creating impressive new technology projects in fields such as health, education, and the environment these students have shown the world new ways to think and to change. Screening for anaemia is as simple as taking a selfie – Eyenaemia is a simple, non-invasive and easily accessible screening tool for anaemia made for use by everyday people. Eyenaemia analyses the conjunctiva and calculates the risk of anaemia, putting years of medical training into the hands of untrained users. The idea for this device results from members of the SMART Crew observing several patients suffering from strokes. They were disappointed by the limited treatment options and noticed that patients encountered considerable suffering and hardship during the rehabilitation process. Thus, “Usens” was developed to provide patients with feedback on their rehabilitation progress, allowing users to receive professional medical care from the comfort of their own homes. Team Access Earth wants to make the world a more accessible place for everyone. Our app, Access Earth, is an app that provides information on a buildings accessibility for those with mobility impairments. We provide information about a place’s ramps, toilets, counters, and more, and we also provide a rating of that places accessibility. Using our app and volunteer network, we hope to bring this information to anyone who needs it, from elderly people to wheelchair users, and to their friends and family. Incredible, world-changing software innovations often come from students. Social networks, music services, digital photography apps, gadgets and robotics – the list goes on. Have you had enough of friends who are always late, but never reply? With Estimeet, you will no longer have to make any more stressful texts and calls to your friends. Estimeet shows you all your friends’ distance and estimated time of arrival from the meeting location as well as whether they are on their way. We want to spend less time worrying about when our friends will show up, and more time having fun. Tep is a entertaining fitness mobile application in the form of an expanded tracking software linked with a tamagotchi which motivates people to do sports in an enjoyable way. The mobile application provides a customizable companion, a virtual pet for users who is to be taken care of by doing sports: the user earns points through workouts which can be spent on food and accessories for the pet. This combination of hardware and software enables the creation of custom nail polish colors on demand. Using the project’s app, choose from color swatches or specify your own custom color and then select a glossy, matte, or glitter finish. The hardware then mixes the pigments and the finish and delivers just enough nail polish for a single application. With this project you can generate your own custom nail polish colors matching your clothes, hair, eyes, or mood. Today, great games come from anywhere and people play them everywhere. On their phones, on their computers, on their tablets, in their browser, with their friends, with anyone, with everyone. Powerful game engines and libraries are available for free so students can get started right away. TurnOn is the story about a living electrical spark named Turnon; the aim of its life is to provide electricity to the city. The inspiration for creating this story was the world event “Earth Hour”, when the whole world turns off lights to raise awareness of the economical use of electricity. Electricity is all around us, and people are so used to it. They absolutely do not notice and save it. But what if the electricity suddenly disappeared? We decided to develop a game to model this situation. The game “TurnOn”, an unusual 2.5D side scroller platformer game, is filled with surprise and wonder, memorable design and graphics, with original gameplay mechanics and soundtrack. The user has the opportunity to control an unusual character that can influence people’s lives in a big city without electricity. In ‘Under Bed’, the main character Judy explores the Dust Kingdom under her bed, using her socks to generate static electricity to climb walls and control dust. Can you imagine that? See how she explores the dust world with her socks! Puppy in Bubble is a Windows Phone 8 physics puzzle game. The story of the game is about Spout, a naughty puppy who gets lost and trapped in a bubble, and needs to be returned to his owner, Adam. Use fans, vacuum cleaners, and other environmental objects to steer the puppy-in-bubble back to his owner. What’s at stake? The Imagine Cup Championship trophy and the once in a lifetime opportunity to meet Bill Gates, the founder of Microsoft Corporation. And this year’s World Champion is no other than Team Eyenaemia from Australia! Congratulations, Team Eyenaemia for being this year’s Imagine Cup World Champion! To this year’s Imagine Cup World Finalists, Congratulations too for making it and for representing your respective countries. It was indeed a memorable weeklong celebration of great innovation! Thanks to Microsoft for hosting a world changing competition. Kudos to everyone as well who worked hard to put up the competition all together, surely it was successful. To the Microsoft Student Partners Global Lead, Mr. Scott Burmester and Imagine Cup Project Manager John Scott Tynes, congratulations to the both of you and we salute you for all of the hard work in bringing the world’s most passionate minds in Seattle. This is truly a week that the participants will never forget. And of course, this incredible team deserves a recognition for raising the Philippine flag. Congratulations to our own, Team Animus for their remarkable performance at this year’s Imagine Cup World Finals. They’re now part of the history. They’ve gone a long way and this is just the beginning. The future is just ahead and without any doubts, these guys will make it farther. The Philippines will always be proud of you. Job well done, Team Animus!